All over Mexico, cooks season chicken with citrus and garlic before grilling it over hardwood. The moist, golden meat gets diced and tucked inside warm tortillas for amazing tacos. 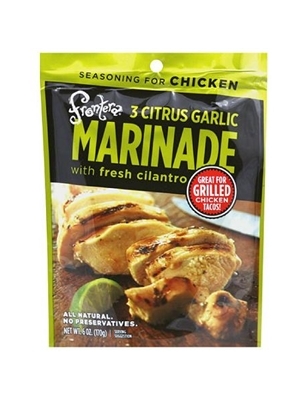 Try Frontera Three Citrus Garlic Marinade on your chicken tonight and get a little taste of Mexico! Lime, orange, and lemon juice from concentrate, expeller pressed canola oil, onion, salt, garlic, jalapeño, cilantro, evaporated cane juice, xanthan gum, spices, citric acid. ALL NATURAL. NO PRESERVATIVES. No gluten ingredients used.